Dystopian ‘Young Adult’ novel adaptations seem to be the go-to genre at present, with a slew of movies hoping to capitalise on the success of the Hunger Games films. Already this year we’ve had Divergent and we have the next instalment of Katniss & Co to come in a couple of weeks. The Maze Runner comes along somewhat under the radar, without any A-list (or even B-list) stars and headed up by an actor (Dylan O’Brien) marking his first leading role. That said, it has been a huge hit – making back over 10 times its budget already, with two sequels green-lit, and with a decently sized audience in the 10.25am showing I was at some 5 weeks after its release. 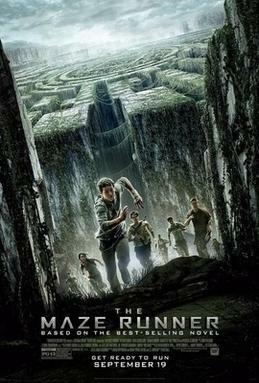 The plot follows Thomas (O’Brien) who wakes up ascending a lift shaft which opens into a grassy clearing, surrounded by other teenagers, with the enormous walls of the maze keeping them all captive. All the teens have entered in the same manner, with no memory of their past life and we learn that this has been the situation for the past 3 years. After a lot of exposition and set-up explaining what the various rules and roles are for those living in The Glade, eventually we see Thomas entering the maze against the wishes of fellow Gladers. So far, so Hunger Games. However, I was yearning for more in the way of character development, something that Jennifer Lawrence gives us in spades as Katniss. Dylan O’Brien struggles in the leading role and left me indifferent to his safety, important when a film is asking us to root for this character across 3 films. Kaya Scodelarios’s Theresa provides the only female role in the film, and whom I can only assume becomes important in later instalments being as she adds nothing to this one. The best character comes in the form of Will Poulter’s Gally, who revels in his role as the villain of the piece. The fact that the film shares so much with the Hunger Games works both for and against it. Comparatively, it falls short, however as the Hunger Games is the Citizen Kane of its niche genre, that isn’t surprising. The film does however have some excellent set-pieces which it pinches from THG – with the scenes in the maze itself providing some thrilling chase sequences and the creepy Grievers are genuinely scary (it’s a 12A certificate, but was cut from a 15 on first showing). The ending partly satisfies in wrapping up this movie and setting up the next one, both answering questions and asking new ones, though I admit I felt the very last scenes were somewhat tagged on. Overall, a by the numbers film that for me placed it in between Divergent and THG as solid young-adult fare.